Judea or Judaea (Hebrew: יהודה‎, Yehudah) is the ancient name of the mountainous surrounding Jerusalem. Its location falls in present-day Israel and the Palestinian West Bank. 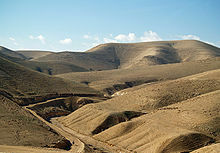 Judea was the territory of the ancient Kingdom of Judah. Judea lost its Nationhood to the Romans in the 1st century BC, by becoming first a tributary kingdom, then a province, of the Roman Empire. The first interference of Rome in the region dates from 63 BC, following the end of the Third Mithridatic war. After the defeat of Mithridates VI of Pontus, general Gnaeus Pompeius Magnus (Pompey the Great) stayed behind to make the area secure for Rome. Judea at the time was not a peaceful place. Queen Alexandra had recently died, and her sons were troubling the country with a civil war for power. They were Hyrcanus and Aristobulus. In 63 BC, Aristobulus was surrounded in Jerusalem by his brother's armies, and the situation was bad. He sent a messenger to Marcus Aemilius Scaurus, Pompey's representative in the area. Aristobulus offered a large bribe to be rescued, that Pompey quickly accepted, but later, he tried to accuse Scaurus of extortion. This caused his downfall, because Scaurus was Pompey's brother in law and was protected by him. The general did not like what Aristobulus had done, and put the prince and high priest Hyrcanus in charge of the kingdom. Judea and Galilee became tributary kingdoms of Rome, which meant that they had to pay tribute to the Roman Republic to buy their protection. Around the same time Pompey was defeated by Julius Caesar, Hyrcanus was followed by a member of his court, Antipater. Caesar and Antipater were both killed in 44 BC, and Herod, Antipater's son, was appointed as governor (tetrarch) by Rome in 41 BC. He became the king (basileus) of Judea in 37 BC, and was known as King Herod the Great. During his reign, the great port of Caesarea Maritima was built. He died in 4 BC, and his kingdom was divided among his sons. One of these was Herod Archelaus, who ruled Judea so badly that he was made to quit in 6 AD by the Roman Emperor Augustus Caesar, after his own people complained about him. The kingdom of Judea now became part of a larger Roman province of Ivdaea. This was one of the few governed by a knight, not a former consul or praetor of senatorial rank, because its income to the Roman treasury was small, and the region was peaceful. Pontius Pilate was one of these procurators. Between 41 and 44, Judea won a little more independence again, when Herod Agrippa was made king by emperor Claudius. After Agrippa's died, the province again went to direct Roman control for a short time. Judea was returned little by little to Agrippa's son, Marcus Julius Agrippa, in 48. However, there was still a Roman procurator in the area, responsible for keeping peace and raising taxes. When he died, around the year 100, the area returned once again to direct Roman control. After Bar Kokhba's revolt was stopped by the Roman forces, the emperor Hadrian changed the name of the province to Syria Palaestina, and Jerusalem became Aelia Capitolina in order to embarrass the Jewish people by attempting to erase the nation's name from the region. 135 - Judea renamed Syria Palaestina by emperor Hadrian. Major cities in this area are Hebron, Bethlehem, Efrat and Beitar Illit. This page was last changed on 13 December 2018, at 08:57.